FOX News Channel’s ‘Your World With Neil Cavuto’ called upon my expertise as a Psychotherapist and Human Behavior Expert to discuss college basketball coach Barry Hinson’s on air rant post his team’s loss. Eric Bolling was in for Neil of which Eric, myself, and Larry Winget had an interesting debate which aired LIVE on 12/19/13. 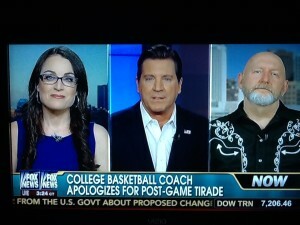 Specifically, Eric and Larry agreed that Hinson’s rant was thumbs up, whereas my stance is that it was thumbs down. Below you will find talking points explaining my rational through the lens of behavior analysis. Coaches play a very important role in the lives of young men: As a coach you can be upset, disappointed, frustrated and passionate – and express yourself without a ‘break another down to build them up’ philosophy. ‘Break me to make me’ is not a healthy philosophical belief system and does not lend itself to the success of another in their achievement and productivity. The myth of manhood: It’s a myth to think young men need to experience shame, hardening, be disgraced and feel unworthy, in order to learn, to hear, to grow, to improve, to perform as their best selves. 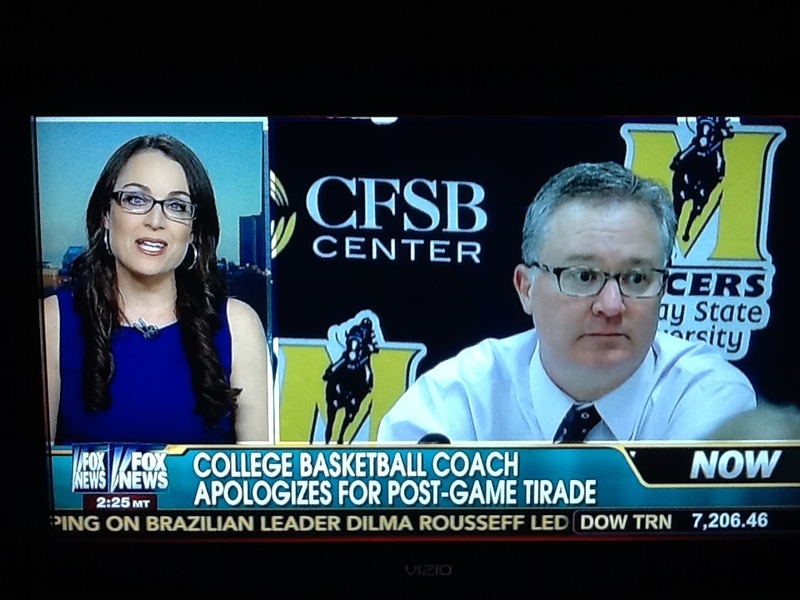 Irrational and unproductive criticism brings future performance down, not up: Coach Hinson’s on air rant was irrational and unproductive. His statements are not the way for a coach to help his players learn and improve for future games ahead. This style of negative put down statements does not provide specific advice for improvement nor offers the inner psyche what it needs to prosper and be the best version of one’s self one can be. Negative rant: “Mamma’s boys”, “un-coach-able”, reference to being a “bad dog” and swatting a bad dog, comparing his wife’s basketball skills as superior in a degrading manner – these are the few key pieces of Hinson’s articulations. None of which even remotely lends itself to anything of value for the recipient. It is simply a rant. Sports is metaphoric and symbolic for life: Sports is indeed comparable for life. In life do we place a positive value on name calling and put downs when a person does not achieve the goal that was desired? No! At home? In a marriage? In a partnership? At work? Coaches are role models for how to deal with loss. How did this coach role model anything of substance that can be used for these players? In this instance he did not. The simple reality is that there are human limitations. Sports is a forum upon which one within a team and many within the team unit try to be the best of the best. When one is not one’s best self through sports young men do experience feelings of failure, shame, and sadness. Sports offers the opportunity to experience the capacity for resilience and the opportunity to experience the healthy ability to cope. Just like in one’s everyday life we have opportunities to respond in a variety of ways. The coach displayed a lack of healthy response reaction. Yet if any one of those players went on a finger pointing unprofessional tirade in similar fashion to Hinson’s verbalization, that would have been deemed unacceptable. Likely any player who behaved how coach Hinson did would be called a sore loser, has poor impulse control, bad sportsmanship . . . Interestingly enough, there are some who feel his behavior was not only acceptable, but desirable. 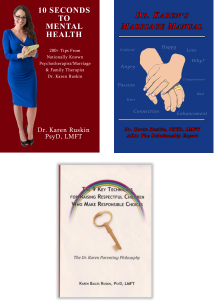 What young men need: In my talks with boys and men during my 20 years to date as a Psychotherapist, the theme remains the same. Males report the coaches they fought for in their playing style were the ones who were direct, hard in professionalism not hard with unproductive statements – not those who put you down, rather those who cheer for them. Those coaches who recognized what the underlying problems were that led to a loss, and a concrete discussion of what the solution needs to be helps players to adjust for their next game. Coaches that were their educator and cheering squad, not one’s that pushed you down and put you down. A coach who understands that his players feel lousy about their loss is of value. This doesn’t infer coaches cannot get mad, angry, upset – it is how the coach verbalizes his feelings that matters. No, no, I am not suggesting a mushy gooshy goo softie poo approach. A coach who is strict and stern indeed has much value for the young adult male. There is a tremendous difference between hard professionalism vs. put downs. It is the put downs that is the mistake Hinson made, and he is certainly not the first coach nor the last to err in this epic fashion. Solution: In addition to the psychology of what young males need as explained above, a solution must also be included as a part of a fabulous coach’s style. Clear goals with clear methods towards achievement of those goals. Evaluative commentary on what the underlying problem was that led to the loss must be addressed. In essence, discussion of what the coach sees as the problem and what he sees as the solution. Belief in one’s team rather than stating they are “un-coach-able” I do urge. Achieving one’s fullest potential is best with positive energy not negative energy in all areas of one’s life whether in the sports arena, in a marriage, in friendships, at work, and in one’s relationship with one’s self. Previous post: Should Kids Be Paid To Eat Healthy?